Kraków is absolutely brimming with eateries that delight even the fussiest of diners. Here is our subjective selection of the best restaurants in the old Polish capital. The culinary dynamic of Kraków differs from that of Warsaw, but it is the second gastronomic centre of Poland and offers many interesting dining spots. Copernicus is housed in the Renaissance interiors of the luxurious Hotel Copernicus in Kanoniczna Street. Talented head chef Marcin Filipkiewicz is co-author of the prestigious Fine Polish Cuisine cookbook, which won awards at the Paris competition Gourmand World Cookbook in 2013. The dishes he creates may be called modern variations with Polish-Italian overtones. The restaurant offers both lunch and tasting menus. Among the numerous dishes worth trying, these definitely stand out: trout tartare with pickled onion, lamb tripe stew with shrimps and garlic, parsley soup with calf sweetbread, Polish lamb with sunchoke and grilled artichoke, and cod with pearl barley and Polish mushroom salad. In the summer, you can take the elevator up to an observation deck located on the hotel’s roof and admire the panorama of old Kraków and the beautiful Wawel Castle. The elegant Trzy Rybki restaurant is located in the open space of Hotel Stary, a building whose history dates back to the 14th century. Krzysztof Żurek, the restaurant’s head chef, gained experience in the kitchens of Varsovian and Italian restaurants. In Trzy Rybki, Żurek has created a menu combining traditional and modern elements, partially inspired by Polish cuisine. The menu changes in accordance with the cycle of the seasons. Spring and summer is a time of fresh vegetables, asparagus and artichokes - a great time to try their dumplings with goat cheese, artichokes and truffles. Autumn stands for game meat, mushrooms and forest fruits. It’s a perfect moment to enjoy duck liver with caramel, saffron and celery. Similarly to previously-mentioned Copernicus, after a delicious meal you can visit an observation deck on the roof and enjoy a view of Kraków’s Main Square, the Sukiennice (the cloth halls) and the towers of St. Mary's Basilica. The two-storey Pod Nosem restaurant is located right at the foot of Wawel Hill in Kanonicza Street, one of the most charming historic streets in Kraków (perhaps even the most beautiful). It is a perfect place to end a walking tour through old Kraków. Their menu is dominated by Polish cuisine with a modern spin, while the distinctive interior is decorated with tapestries. Przemysław Bilski, the head chef, gained his vast experience at restaurants in London. The seasonal menu is full of truly tempting dishes, such as asparagus soup, duck dumplings with farm cheese flakes, goose breast marinated in raspberries and salt from Wieliczka, or veal shank with young cabbage and smoked potatoes. You can also try a very fine caviar produced by Polish company Antonius Caviar. 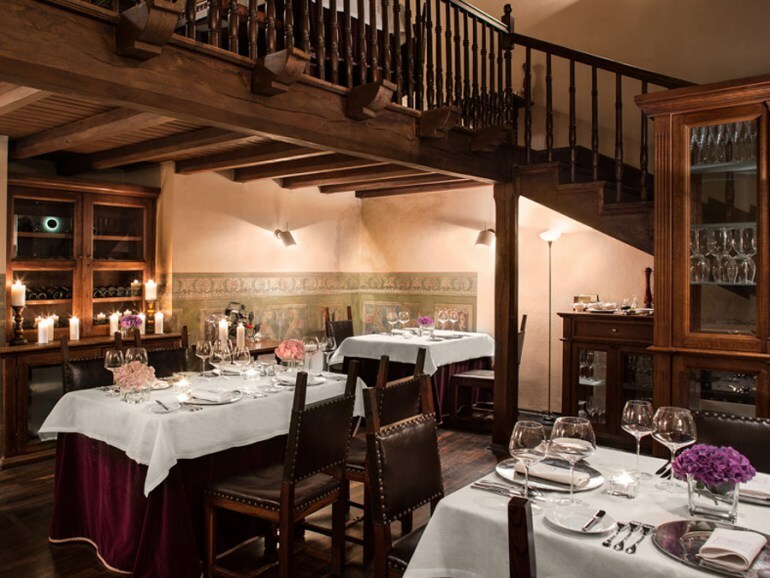 Located in the Kazimierz district, Bottigliera 1881 made its debut in the 2016 edition of the Michelin guide. The owners call it ‘a wine bar’, as the place offers over 400 kinds of wine selected by sommelier Michał Jancik, but Bottigliera is also a restaurant with a very short and refined menu. It’s really tiny - the space only fits around twenty people. Paweł Kras, the experienced head chef who earned his chops both in Poland and abroad, keeps a menu that is both seasonal and creative. For example, their bouillabaisse soup is served with pak choi, spring onion and shrimps. In the menu, you’ll also find variations of Polish dishes, such as golonka (ham hock) with horseradish, chives and mushrooms, zander with parsley, crayfish and young vegetables, or lamb with panicgrass and beetroots. It goes without saying that the dishes taste even better thanks to the sommelier’s perfect advice. Biala Róża is located in a historic palace next to the Planty gardens and near the Market Square and Wawel Castle. The sophisticated atmosphere evokes the traditions of the city and the history of the region. Chef Łukasz Cichy creates dishes inspired by old recipes from the Lesser Poland region, which over time has seen Jewish, Hungarian, Austrian, and Ukrainian influences. In the elegant modern interior, diners can enjoy black turnip cream soup with horseradish and crispy onion chips, guinea fowl with nettle sauce, peas and smoked bacon, Polish pierogi (dumplings) with kasza krakowska (a rare kind of groats made from buckwheat), bryndza cheese and peppermint. For a starter, try lamb’s tongue with sorrel, sea-buckthorn and spinach, or Baltic herring with spring onion, new potatoes and sour milk! 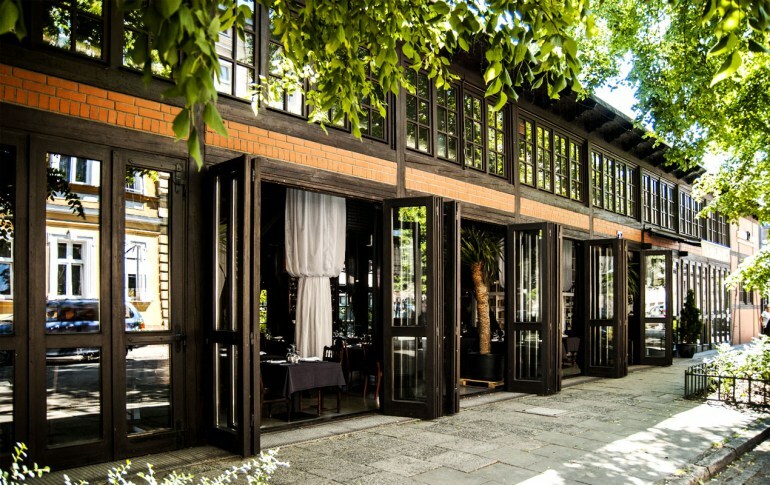 This restaurant is located in the Kazimierz district, in a restored tenement with a modern interior. Mateusz Turaj, the chef, previously worked at the Ancora restaurant in Kraków, where he learned from Adam Chrząstowski, another eminent cook. Miodova serves modern Polish cuisine, sometimes inspired by recipes from a 19th-century Polish cookbook, Ilustrowany Kucharz Krakowski by Maria Gruszecka (this is where their recipe for crayfish soup comes from), and Jewish and Austrian-Hungarian cuisines. On the menu, you’ll find baked goose stomachs with tomatoes and rosemary, young herring in a herbal pancake with gherkin, or modern variations of pierogi Polish dumplings - for instance, with lamb brawn and grana cheese. Wines from Central-Eastern Europe go great with these dishes - especially the one from Srebrna Góra, a small village located near Kraków! Zazie Bistro is one of the most popular restaurants in town, whether it's among Cracovians, Varsovians or tourists. It's always full so booking a table in advance is a wise move. Located in Kazimierz, it references the style of a French bistro and specialises in cuisine with a French twist. Head chef Daniel Myśliwiec, who previously worked in Spain, was recently dubbed a young talent by Gault & Millau. Their calf sweetbreads served with brown butter, ricotta ravioli, dried duck breast, yolk and roasted pistachios has been their best-selling snack for a few years now, as well as the Parisian liver pâté with armagnac-soaked dried plums. In addition to dishes with non-obvious connections, such as lamb shank in chocolate sauce with potato puree, caramelised chicory, apples and almonds, you can always count on classics such as beef bourguignon. The restaurant Pod Baranem has been operating successfully for many years. Located near Wawel Castle, it introduces guests to the secrets of traditional Polish cuisine with an original flare. The interior is unique, perhaps a bit old-school; the waiters are nonchalant, but professional. On the one hand, you 'feel' the old communist era, while on the other you are surrounded by art – for example, the paintings of Edward Dwurnik. Owner and chef Jan Baran describes the restaurant’s food as ‘family cuisine’. Apart from traditional Polish dishes like stuffed cabbage (cooked with groats, and in a sumptuous mushroom sauce) and the delicious duck, the 'must haves' here are game, pies, and fish from the restaurant’s own smokehouse. There is probably no other place evoking the spirit of the past so well - in a good, incredibly tasty way. Studio Qulinarne is one of the most pleasant restaurants in the Kazimierz district. It has a beautiful summer garden with a small playground for kids. Housed in a post-industrial, restored glass building that is part of a former tram depot, the restaurant boasts a sleek and modern interior. Passionate about modern cuisine, chef Oskar Zasunia brings together Polish and international influences in his dishes. In the summer, the menu features rabbit loin with lovage, common morel, fermented spring onion and buckwheat, or pheasant with beef tongue, chocolate, spinach and a potato chip. Or maybe you’ll feel like having beef tartare with shiitake-enoki marmalade? This recently-established steak house near the main square specialises in meat dishes, especially steaks prepared from the limousine breed of cattle raised naturally in Poland. The respected chef Adam Chrząstowski heads the Ed Red kitchen. The restaurant offers not only dry seasoned steaks with classic French sauces such as demi glace, but also a number of other more daring options that are worth a try – offal on grilled toast (which is increasingly common in Poland), calf thymus, tongue, liver, brains, and recently even bull testicles, beef heart, baked marrow bones or brawn. Their Polish farmer’s cheese is also a must and always on the menu. The wine bar (and shop) Lipowa 6F is located next to the Schindler’s Factory Museum. It specialises in the wines of Central and Eastern Europe. In its post-industrial interior, you can sip Armenian brandy, spirits from Hungary, Romania and Poland, Polish ciders and regional beers. You can also snack on Polish farm cheeses and Hungarian cold cuts. Lipowa is famous for organising interesting meetings with the eminent food and wine specialists, inluding chefs and wine-makers. 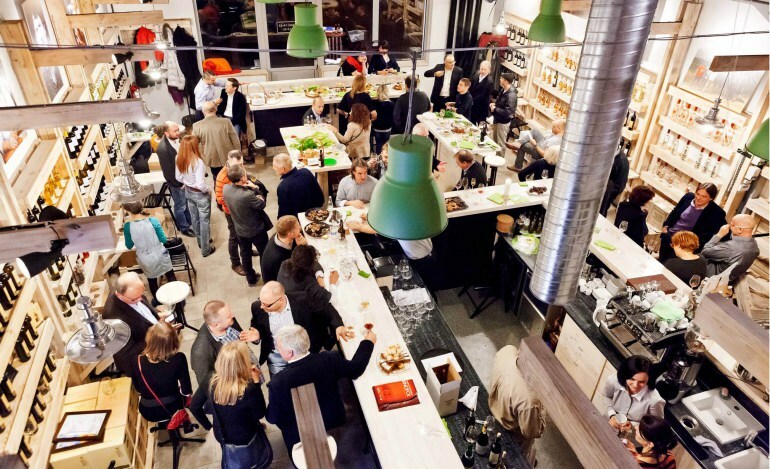 Last year, Polish magazine Wino dubbed the place the best promoter of wine culture in Poland thanks to its event series Podwieczorki na Dwa Kieliszki (editor’s translation: A dessert and two glasses). Outside the entrance to the shop, a food truck offers visitors a variety of excellent grilled specialties from the Caucasus, including lamb in pomegranate sauce and eggplant with coriander. Written by Magdalena Kasprzyk-Chevriaux, June 2015, translated by A. Aniskiewicz, July 2015. Updated May 2016, with translation by N. Sajewicz.